Datapeak’s finished product is usually a direct mail marketing piece. We work closely with Advertising Agencies, Graphic Artists, Offset Printers, Businesses, Colleges and Non-Profits using their expertise in Direct Mail Marketing and our expertise in personalizing those pieces and putting them in the mail. To service clients, we automate mailings to assure the lowest postal rates and prepare all required Postal Reports. 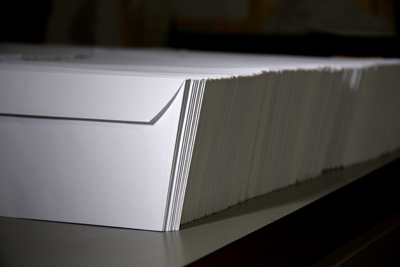 Our direct mail projects range from 500 to 5 million pieces. Another very important service is the personalization of pieces that an offset printer may have printed. Names and other valuable variable information attached to client databases are used to personalize each piece making them much more effective. Datapeak can personalize letters, postcards and variety of other preprinted material. In addition, Datapeak provides Fulfillment Services for our clients. These are custom jobs or unique projects that many times require hand work. Whatever your needs might be, Datapeak can find a solution to make your project work!